It’s time for a fall makeover. 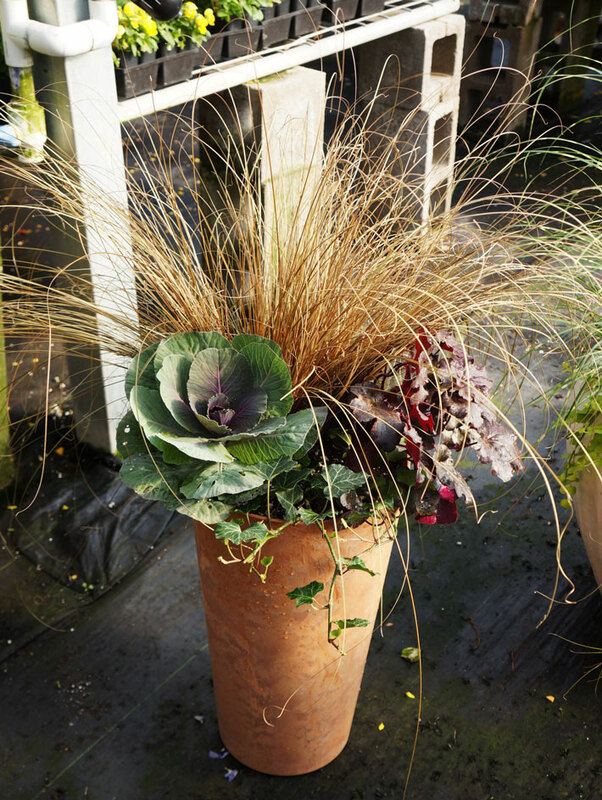 Give your garden a fabulous finish by filling fall containers with plants that stage a fall show. 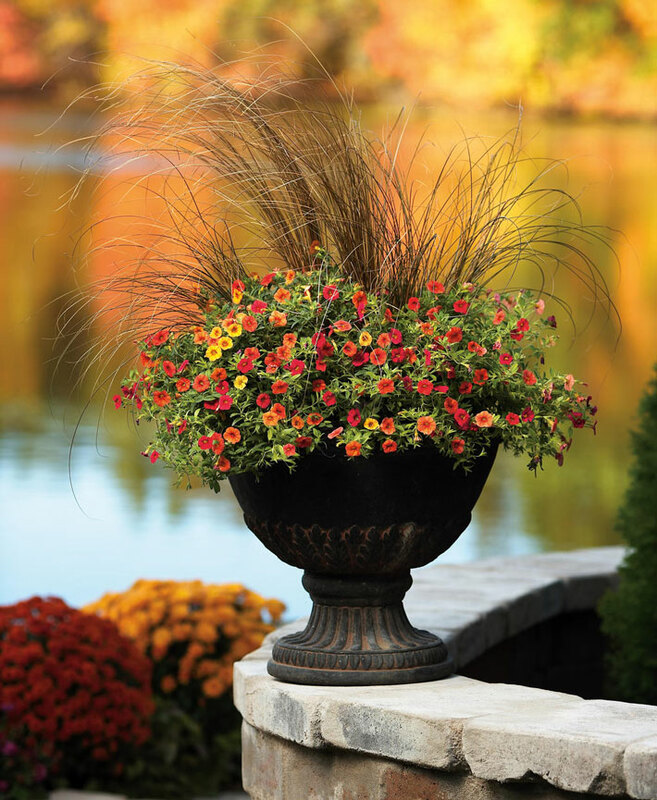 The approach of fall means it’s time to redo the containers that grace your front porch or backyard deck. 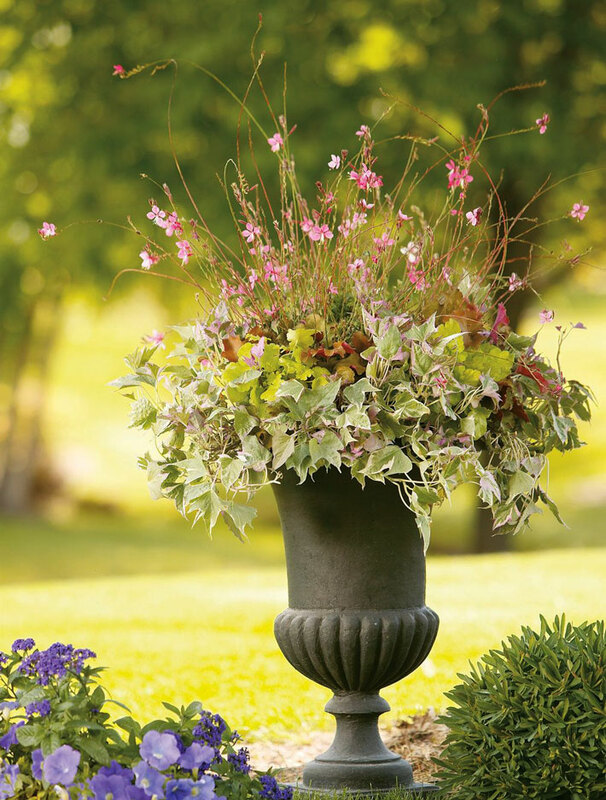 With a simple swap, you can outfit tired, scraggly container gardens with plants that keep their good looks even when Mother Nature gives them a cold shoulder. 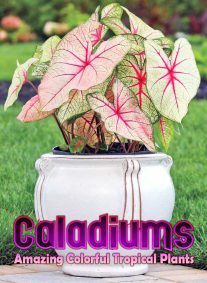 Some plants won’t need replacing, but instead can easily be refreshed with trimming and fertilizing. Others won’t require even a tweak to strut their stuff throughout fall. 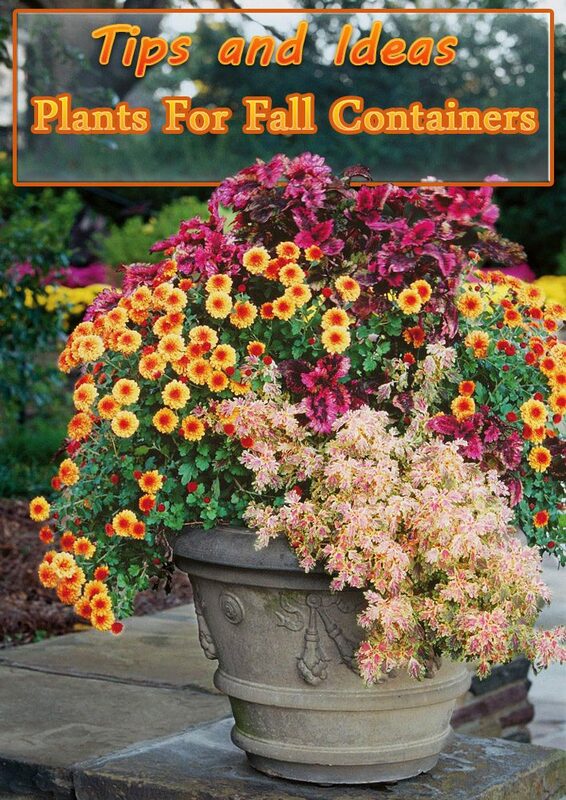 There are many attractive fall plants that lend themselves to container plantings. 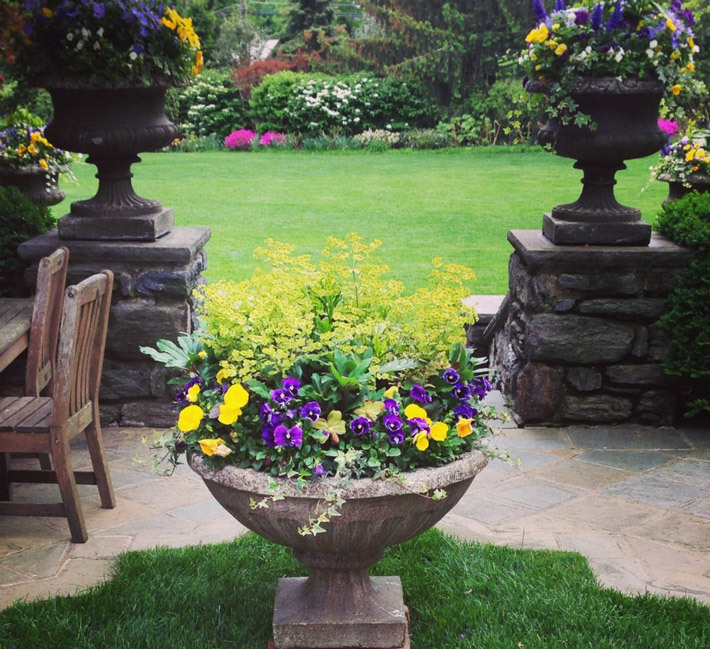 Fill a low tub or basket with multi-colored Pansies (Pansy/Viola) to greet visitors with a cheerful “hello.” Or line your porch steps with container Chrysanthemums (Mums) in identical clay pots. 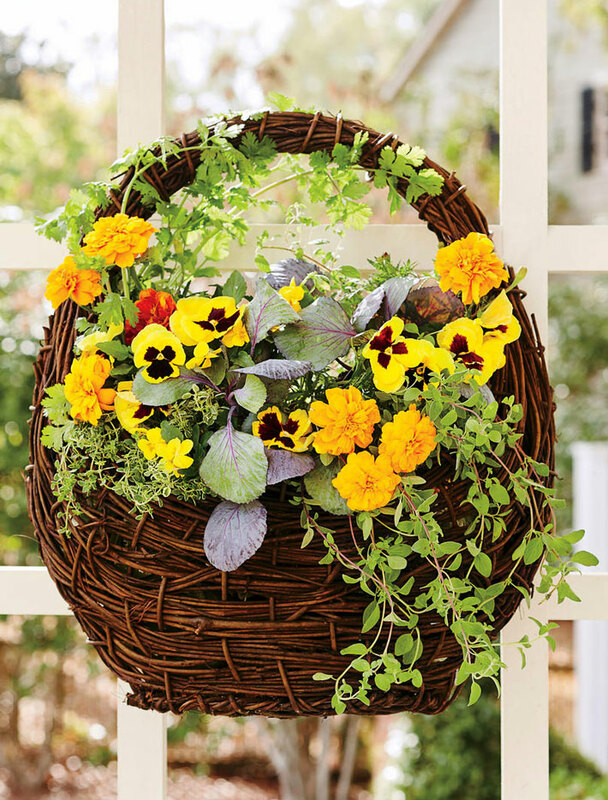 Choose flower colors for fall containers to complement or contrast your door wreath and tie pots with matching fabric bows. 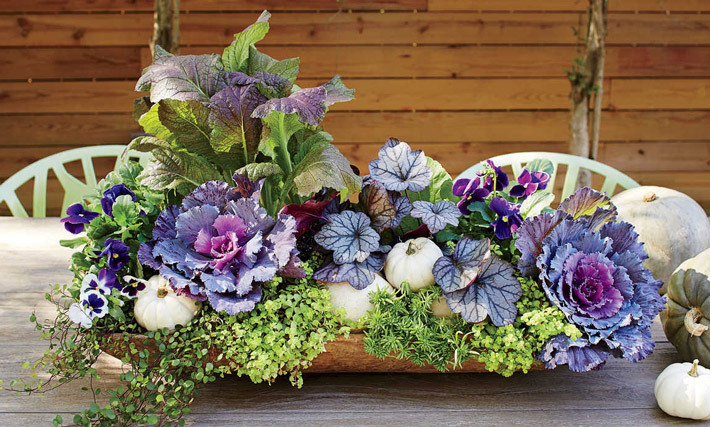 You can do something similar with Ornamental Cabbage and Kale (Brassic, Ornamental Kale) plants. Use clay or ceramic pots of varying heights and sizes with one plant per pot to emphasize the individuality of each plant. 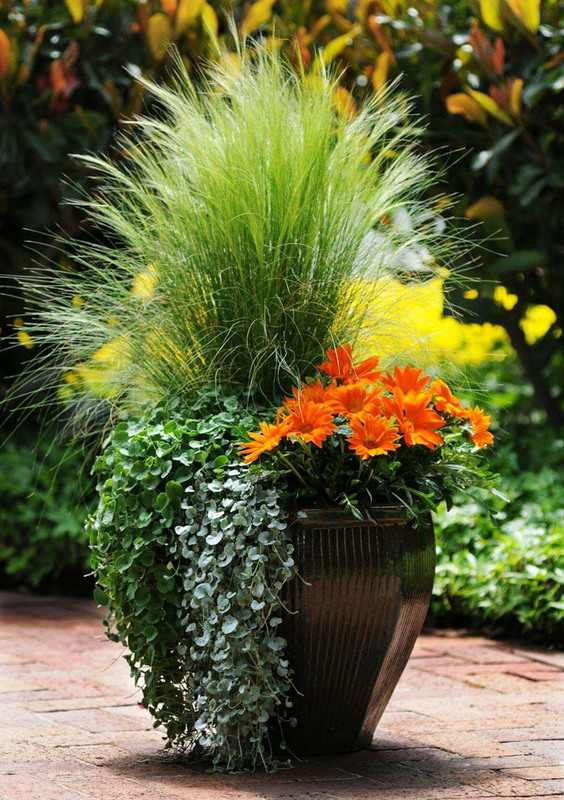 If you’re planting large containers, combine unique flowers, foliage and Ornamental Grass to create eye-catching container plantings in rich autumn colors. 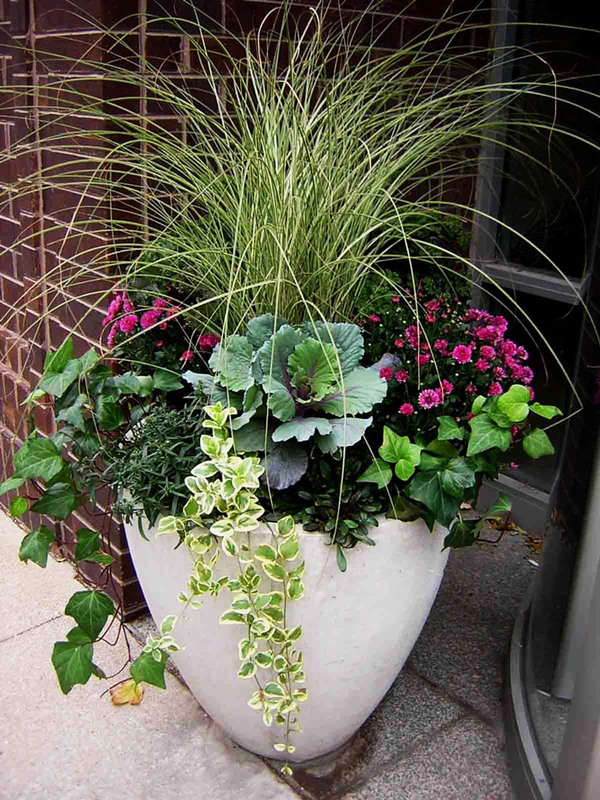 Best results are achieved by choosing a primary and two accent plants, although large containers will handle a larger plant variety. Select complementary or contrasting plant colors and a variety of textures for maximum eye appeal. 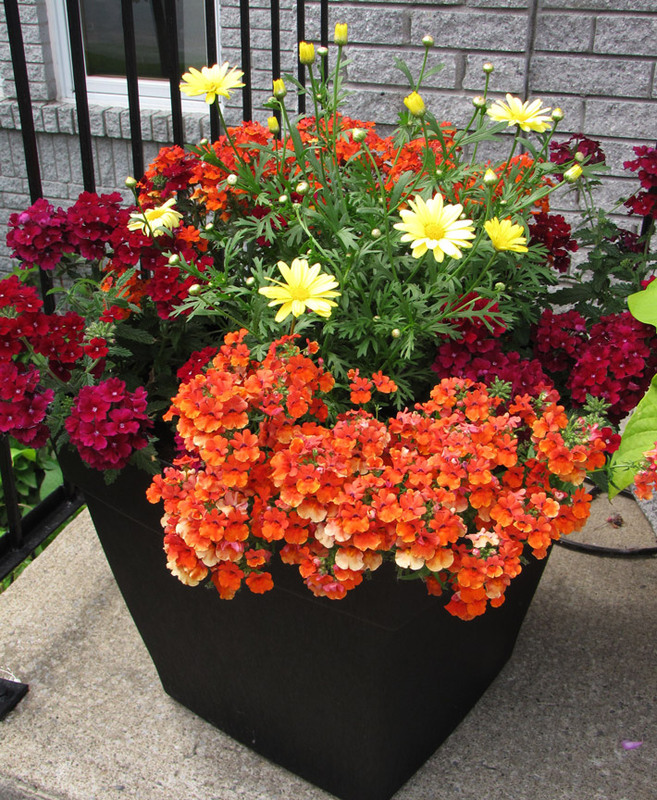 If reusing containers, be sure to replace spent soil with fresh to provide plants with maximum nutrients. 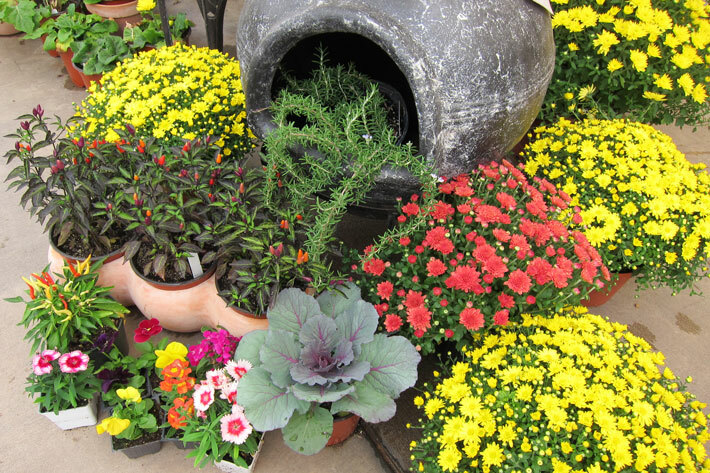 The best time to replace plants or pot up new fall containers is in early fall, when summer’s heat has waned and night temperatures are inching toward the cooler side. Depending on where you garden, this means anywhere from late August to late October. To swap out tired annuals, slip a hand-held trowel into soil around the base of a plant. Gently pry the plant from soil. Tuck new plants into holes created by removing existing plants. Add removed plants to the compost pile. 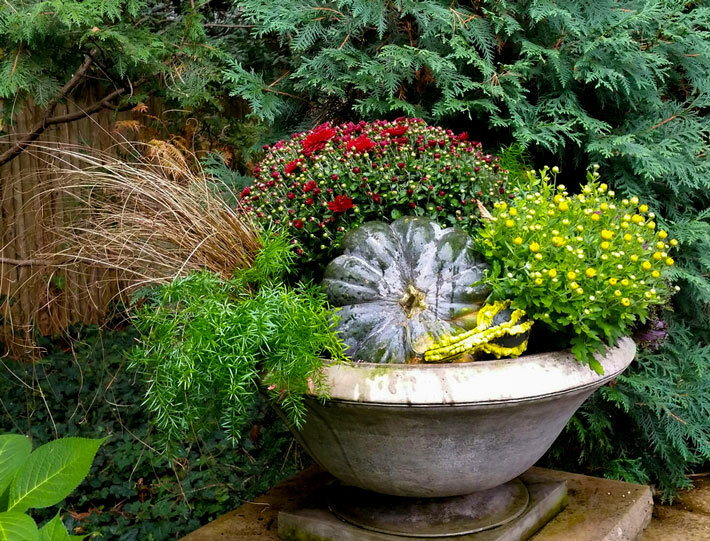 Some plants segue from summer to fall without missing a blooming beat. Ornamental grasses, Dusty Miller, Narrow-Leaf Zinnia and Sedums fall into this group. 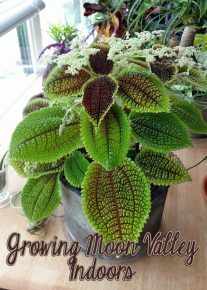 Others, like Petunia or Coleus, perform strongly into autumn, as long as you trim stems back by a third in late summer and fertilize to stimulate new growth. Not sure what plants to try? 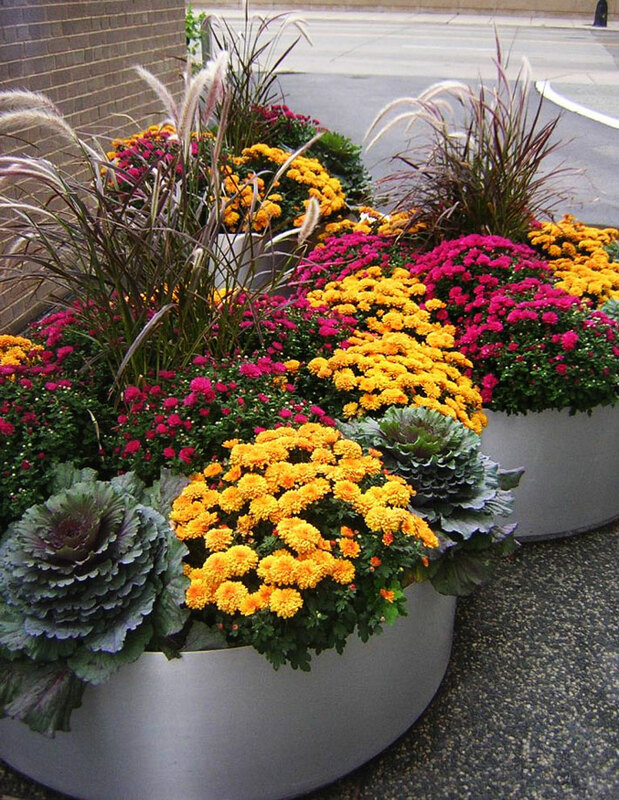 Use our list of fall favorites to create fall containers full of lively color. Many of these plants will provide a strong winter show in USDA zones 9-11. African Daisy (Osteospermum spp.) – Daisy-style flowers open in white, gold, orange, purple and other shades. 12-18 inches tall and wide. Sun to part shade. USDA zones 9-11. Aster (Aster spp.) – Daisy-like blooms in shades of pink, white or purple. 1½-5 feet tall x 6-24 inches wide. Sun to part shade. USDA zones 4-9. Garden Mum (Chrysanthemum) – Cheerful flowers in various forms and hues, including orange, red, purple, yellow and white. 12-26 inches tall and wide. Sun. USDA zones 5-9. Nemesia (Nemesia spp.) – Dainty flowers in pink, red, white, purple, or yellow. Annual. 12-18 inches tall x 6-9 inches wide. Sun to part shade. USDA zones 2-11. Pansy (Viola x wittrockiana) – Colorful flowers open in many hues, including purple, yellow, burgundy, white and almost-black. 6-9 inches tall and wide. Sun to part shade. USDA zones 7-10. Snapdragon (Antirrhinum majus) – Flower spikes covered with blooms in white, yellow, pink, red, lavender and other colors. 12-18 inches tall and wide. Sun to part shade. USDA zones 4-11. Stock (Matthiola incana) – Clove-scented blooms in lavender, white, pink or violet. Annual. 9-18 inches tall and wide. Sun to part shade. USDA zones 7-10. Sweet Alyssum (Lobularia maritima) – Sweetly-scented blooms carpet the ground in white, pink, lavender or purple. Annual. 3-6 inches tall x 6-9 inches wide. Sun to part shade. USDA zones 5-9. Twinspur (Diascia barberae) – Trailing plant with delicate-looking flowers in pink, coral or white. 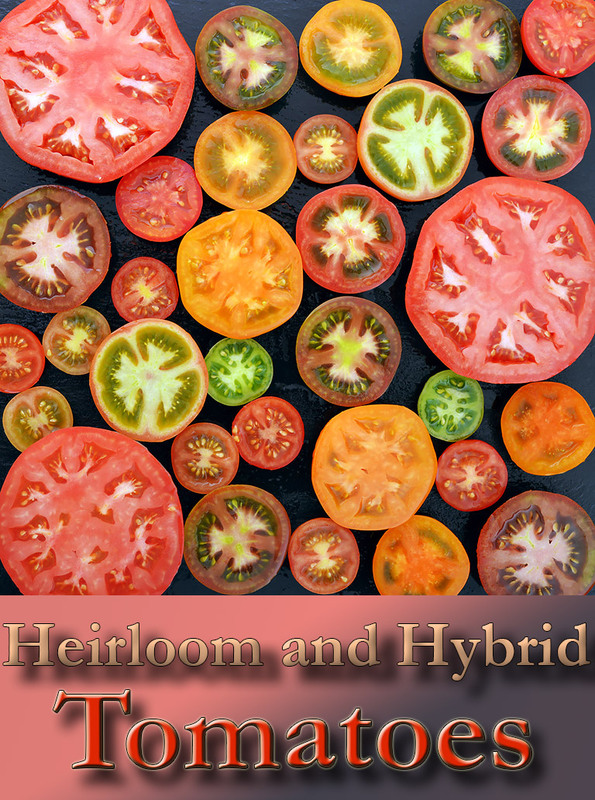 Hybrids are more upright. Annual. 12-18 inches tall x 18-24 inches wide. Sun to part shade. USDA Zones 9-11. Viola (Viola spp.) – Diminutive Pansy-style blooms in many hues, including purple, yellow and white. Annual. 6 inches tall and wide. Sun to part shade. USDA zones 6-10. Coral Bells (Heuchera hybrids) – Leaves unfurl in shades of mahogany, orange, purple, silver, chartreuse and various combinations of these and other hues. 6-10 inches tall and wide. Sun to part shade. USDA zones 3-9. Dusty Miller (Senecio cineraria) – Finely cut, silver foliage lingers lushly through hard frosts. 6-12 inches tall and wide. Sun to part shade. USDA zones 8-10. Elijah Blue Fescue (Festuca glauca ‘Elijah Blue’) – Blue leaves form grassy tufts. 6-18 inches tall x 6-9 inches wide. Sun to part shade. USDA zones 4-10. Ornamental Cabbage (Brassica oleracea) – Colorful cabbage-style leaves with centers of pink, white or lavender, as well as variegated blends. Annual. 10-12 inches tall and wide. Sun to part shade. USDA zones 2-11. Pink Muhly Grass (Muhlenbergia capillaris ‘Regal Mist’) – Green grassy leaves topped with pink-mauve feathery seedheads in fall. 36-48 inches tall x 24-36 inches wide. Sun to part shade. USDA zones 5-10. Purple Fountain Grass (Pennisetum setaceum ‘Rubrum’) – Burgundy leaves with pink, to maroon, to black seedheads. 24-36 inches tall x 15-18 inches wide. Sun to part shade. USDA zones 9-11. Sedum sieboldii – Blue-green succulent leaves on trailing stems. 6-12 inches tall and wide. Sun. USDA zones 2-10. Mexican Feather Grass (Nassella tenuissima) – Silky seedheads glow in autumn light. 18 inches tall x 12 inches wide. Sun. USDA zones 5-10. Toffee Twist Carex (Carex flagellifera ‘Toffee Twist’) – Slender, iridescent bronze foliage. 18-24 inches tall and wide. Sun to part shade. USDA zones 7-10. Variegated Japanese Sedge (Carex oshimensis ‘Evergold’) – Creamy yellow leaves edged in green. 8-10 inches tall x 18 inches wide. Sun to part shade. USDA zones 5-9. Coleus (Solenostemon) with its fire red, burgundy and green variegated leaves is a fall container favorite. Heuchera (Coral Bells) with their frosty silvery green or purple leaves blend beautifully with autumn tones and provide color depth to fall planters. Ipomoea (Sweet Potato Vine) provide a graceful wine-colored counterpoint to brighter fall plants like Ornamental Cabbage and Kale. Snapdragon (Antirrhinum) provides a spot of bright color and vertical height to large container plantings.